This repertory is based on the new Synthesis treasure edition, with the inclusion of Kent’s Treasure Edition (newly discovered additions). Only traditional, well known authors are included, which explains the absence of author references. It is a compact edition, printed on Bible paper and in a handy format, making it useful for carrying to home visits and seminars. It is more suited to students and those preferring a more traditional approach than to those exploring new territories in homeopathy. The Textbook contains a very useful addition: almost 100 pages of veterinary symptoms and concepts. It also has reference material: a list of remedy abbreviations, a word index, and lists of localisations by chapter and name, as well as an explanation of the book’s purpose and design by the author. All in all, it is concise, reliable, and accessible. 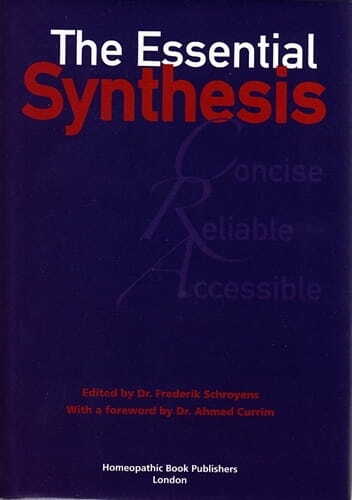 Based on the new Synthesis Treasure edition, but only all traditional, well known authors are included. No author references, as only reliable authors used. More easy readable, larger font size. Ideal for students and more traditional working homeopaths. Ideal to carry with you to a seminar or home visit. Included are all 11.000 corrections of Kent’s Treasure + Kent’s newly discovered additions. After years of ever-increasing sizes of repertories this is a step back - to essentials. This repertory is truly compact and you no longer need a travel case to carry your repertory! Printed in India by B Jain Publishers, The Essential Synthesis has a nicely familiar feel for those who grew up in college with the Indian edition Kent Repertory. There is an easy access thumb index and two page markers (which in my copy are unfortunately too short to be of any use). Frederik Schroyens has reduced the information to usable levels: the sources have been selected to cover only the most reliable: many of the later provings have not been included, such as some by Jeremy Sherr or Misha Norland. This raises issues about the process of deciding which remedies and sources to include. but it also shows most clearly the aim for this new Essential repertory: 'Concise, Reliable, Accessible'. After all, Synthesis 9.1 is available with the most comprehensive information to date. But the restriction in sources is not the only way in which this book has been reduced to a minimum: Cross-references to rubrics for example, have been restricted to three main ones and all chapter references are reduced to four letters. To me the most important 'saving', is the omission of author abbreviations in the printed book. Together with white paper (yellow in Synthesis 9.1) and a larger font size than Synthesis 9.1, this dramatically improved the readability. There is a fascinating account of the adventures of Dr Ahmed Currim, who spent years tracking down Kent's own annotated copy of his Repertory. Shades of Indiana Jones, he tracked down the document, by now torn up, in rural India. The results are added into this edition. A paperback textbook accompanies the repertory. The textbook offers a list of remedy abbreviations, an index of words and of localisations. As a user of Roger van Zandvoort's The Complete Repertory I found the latter particularly useful, as the localisations are not done in the same way. Also included is a repertory for veterinary symptoms and concepts, claimed to be a new long-awaited venture. I would recommend this new repertory to all new students and to those who want to travel light. In an ideal world I would use The Essential Synthesis backed up by a comprehensive computer repertorisation program.